Lately I find that much of my cooking inspiration comes from going out to restaurants with few vegan options and being forced by hunger to order something I wouldn’t ordinarily eat. Last Saturday, after a long day of marching and standing at the Women’s March on Jackson, I wound up with some friends at one of the few places in town that is open at 3pm on a Saturday. A glance at The Manship’s menu told me that they served no vegetarian entrees, much less vegan, but a very helpful waitress showed me the side dishes I could have as a vegetable plate. One of them was Spanish Potatoes, and it turned out to be one of the best potato dishes I’ve ever had. Crunchy and spicy on the outside, creamy and soft on the inside, each little morsel was a delight. But. You knew there was a “but,” didn’t you? They were fried. Now, please don’t look at me like that. I’ve never claimed to be perfect, and sometimes, when I’m very hungry and there are no other options, I have tasted fried food. And in my defense, the waitress didn’t mention they were fried, and they weren’t very oily. But I could tell from the texture that these potatoes were fried, not baked. Of course, I immediately started plotting how to get the same crunchy-outside/creamy-inside without using oil, and I realized right away that this is a job for my new toy, the air fryer. The air fryer works by surrounding the food with circulating hot air, and it allows food–especially potatoes–to get crunchy on all sides a little better than an oven will. I knew that the secret to the soft interior was to cook the potatoes first, coat them in seasonings, and then air fry them, so I popped them into my Instant Pot to cook. And it worked! My fat-free Spanish potatoes came out delicious, probably as close as possible to the original without oil. The only complaint my husband had was that they were not spicy enough, so be sure to add more hot pepper to the recipe below if you like spicy. Don’t worry if you don’t have an air fryer or an Instant Pot. I’ve included instructions for making the potatoes using a regular pot on the stove and a baking sheet in the oven. If you try it without “special equipment,” please leave me a comment to let me know how they came out. 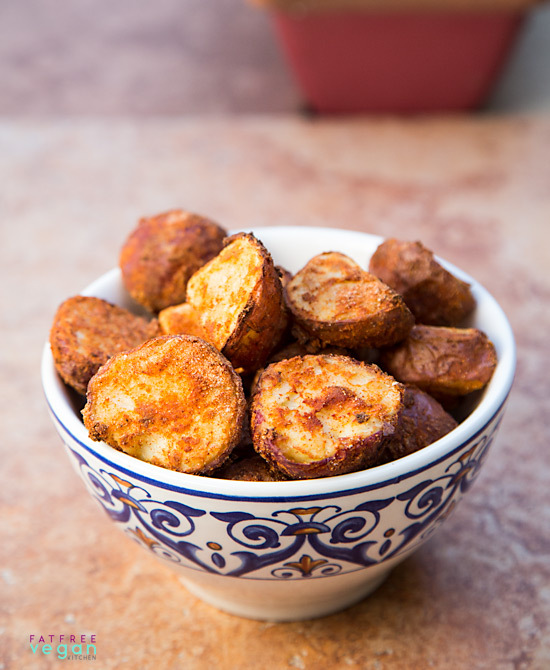 You don't need special equipment to make these delicious crispy potatoes. See the alternate instructions for stovetop and oven preparation. Boil the potatoes until just soft using one of the following methods. Using an Instant Pot or pressure cooker: Place the potatoes in the pot with 1 cup water. Add one teaspoon salt, if desired. Seal and set to cook on high pressure for 4 minutes (use manual setting on Instant Pot). Quick release the pressure after 4 minutes at high pressure. On the stove: Place potatoes and optional salt in a saucepan. Cover with cold water. Bring to a boil and cook until potatoes are just tender, about 10-20 minutes. These look wonderful. Here is my question. If you don’t buy canned beans, where do you get aquafaba from? And can you freeze it to use later. I skip so many recipes because I make my own beans from dry. Any thoughts? Thanks! You can absolutely use the liquid from beans you cook from dry. I have heard that boiling until it’s slightly reduced makes better aquafaba, but that may just be important if you’re making a meringue from it. And I freeze mine in an ice cube tray and transfer to a freezer bag once it’s frozen. I actually used one cube (1 tablespoon) defrosted for this recipe. Curious if you will be offering the air fryer in your kitchen store any time soon? Those potatoes look yummy! Thank you so much for this recipe. I too have ordered Spanish potatoes when there aren’t other options available. It’s great to be able to make them at home. I can’t wait to try this recipe! Oh this recipe sounds just delicious! I wouldn’t have thought of the aquafaba here! I heard that when boiling the potatoes before you bake them to add a teaspoon of baking soda to the water. It apparently changes the structure of the outer layer of potato helping it get crispy in the baking process. Didn’t know if you had tried this process, but I will be trying it soon. Just made these tonight! Delicious!! Can you make more similar recipes with different seasonings?!? Please? ☺☺☺. These are fantastic!!! Thank you so much for yet another go to recipe. You continue to impress. Just made these tasty taters! My husband loved them! I used BBQ sauce mixed with Aquafaba in place of the tomato paste. Then I low broiled them at the end for a bit extra crisp. I just got an air fryer and can’t wait to try these in it! Will be making these just before game time Sun. I will enjoy with a good book. Thank you Susan for all your inspiration and nutritional facts which are very important to me. Looks like a great recipe but can you tell me the serving size for 171 calories. You mention 1 g as serving size but that can’t be it. A serving size is 1/3 of the recipe. This recipe software only figures servings in grams, and I haven’t calculated it that way yet. Thanks for mentioning the March. 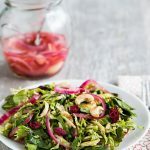 I have always thought your blog exceptionally thoughtful as well as full of good recipes, but your decision to do so despite possible negativity catapults you to the head of the class for me. Thank you! Whole World is watching us. Thank you, Laura. I decided that if I can’t be me on my own blog, what’s the point of having one? I’m not planning to inject politics into my posts all the time, but when something like the March is part of the story, I’ll include it. If I lose some followers because of my opinions, so be it. 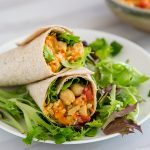 Could I use the water from canned garbanzo beans? Reason being I am on FODMAP for IBS-C and dry beans are not allowed. I know it sounds crazy but that’s the way it is. Did you peel the potatoes? The recipe doesn’t seem to mention that. I love patatas bravas; wondering if you’ve tried making the sauce at home, too? Nope, I left the peel on. 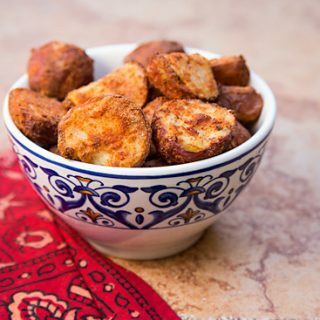 I do have a patatas bravas recipe at https://blog.fatfreevegan.com/2006/11/patatas-bravas.html. My husband and I tried it a few weeks ago with eager anticipation. We thought 1 tablespoon aquafaba and 1 teaspoon tomato paste did not provide enough moisture or coating power. We had to double it. It didn’t look like your but it tasted ok. How can that small amount cover the potatoes??? I had correct amount of potatoes as I used a scale. The aquafaba and tomato paste should just barely moisten the potatoes. If you use too much, it can be hard to get them to crisp up, so that’s why I use so little. 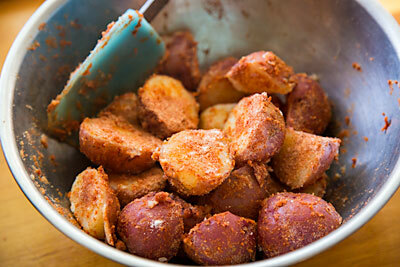 It’s the paprika and other spices that you really want to make sure coat the potatoes completely. this looks simply amazing, can’t wait to try it! unfortuntely i have to stick to my gluten free diet but this is great, because brown rice flour is naturally gluten free, so i can enjoy it without having to rework the recipe. thanks so much for sharing it! 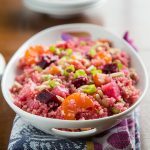 if you ever need more inspiration, i’d love you to stop by eatwholegreens.com for some vegan awesomeness! These look great, and I can’t wait to try them. I just bought an air fryer. Because I am sometimes lazy and don’t like the cleanup, I might try precooking the potatoes in my microwave first. I’ll let you know how it goes. Thanks for the recipe! Love these when at a tapas place. I will have to try them at home. I hope you had a laugh that a restaurant named Manship was chosen after the woman’s march. Hi- I had a Power Air Fryer XL and I did not like how it cooked potatoes, they were firm in the middle and crispy on the outside. Can I ask what type you are using? Thanks! This looks like a great recipe! Love it! Thanks for sharing the simple and awesome recipe. You know what’s the crazy thing–it didn’t even occur to me or any of the women I was with! We’re so used to it as a local name that we didn’t think about the word. Very simple, easy to cook and delicious recipe. Thanks for sharing it with us. Susan – Can you recommend a brand of air fryer or share with us what brand you use? Whoops! I just now saw your comment about the brand you use. I’m still interested in any you might have heard good things about. I’ll check into the link you provided. Many people like the GoWise air fryers because they are less expensive, but I often hear about problems such as the coating chipping off the basket after a few uses or that the basket doesn’t go into the machine unless you hold it at a certain angle. The Phillips has none of these problems. But it’s more expensive and less “high-tech” because it has a simple dial instead of digital controls. I’m happy with it because I got it on a good sale, and I would buy it again. It’s fine for 2 people but I would want a bigger one for 3 or more. Everything I’ve read online about air fryers says you use “just a little oil,” but you make it sound like you don’t really have to use oil at all. True? You have success without any oil? I really hate oil, and don’t want to use it. Thinking of investing in an air fryer if I can truly use it without oil. Thanks for your reply! You can use an air fryer without oil, just like you can use an oven or a skillet without oil. The results won’t be the same as with oil, but if you’re used to food without oil, you may not mind. The instructions call for a little oil because most people are hoping to replicate fried food with less oil and don’t mind using a little oil if they can have good results. Oil does seal in moisture while crisping the outside of the food, and you won’t get that same texture from oil-free air fried foods. If you want to see the kinds of things people are making in their air fryers without oil, please join my Facebook group FatFree Vegan Air Fryers. 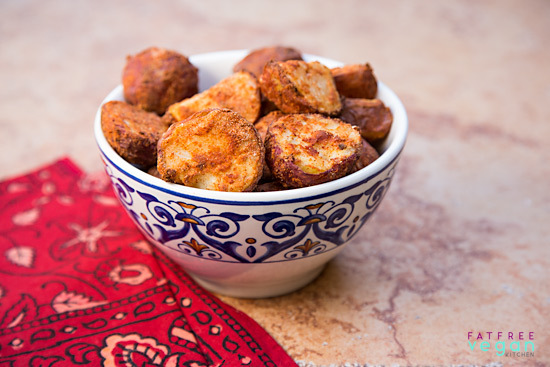 These potatoes looks amazing and your new site looks gorgeous, Susan! You are the BEST! Keep up the great work!! Omg! Looks like a great healthy recipe. 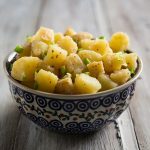 I can’t wait to try making these fat free Spanish potatoes at home and you can do it in a pressure cooker, even easier. I made these potatoes by first steaming them on the stove, and then baking them in my regular oven. They came out crispy on the outside, soft and smooth on the inside. And the spices stuck nicely to the potatoes and made them very tasty! Thanks so very much for the recipe! My non-vegan family enjoyed them too! Have you tried this recipe using sweet potatoes. Sounds wonderful. I tried it and loved it. Great recipe! This is something I’ll definitely for thanksgiving this weekend. Yummm! Wow Susan, these were delicious! My husband ate two servings and didn’t leave any for the kids. Let us know if you try any other flavor profiles with these. I’m sure there could be endless variations.